My family has been using our Sharp air purifier for about a decade. It has been our reliable source of clean air within our bedroom. In recent years, it also doubled up as a mobile unit following us to the living room when the PM2.5 level was really high. 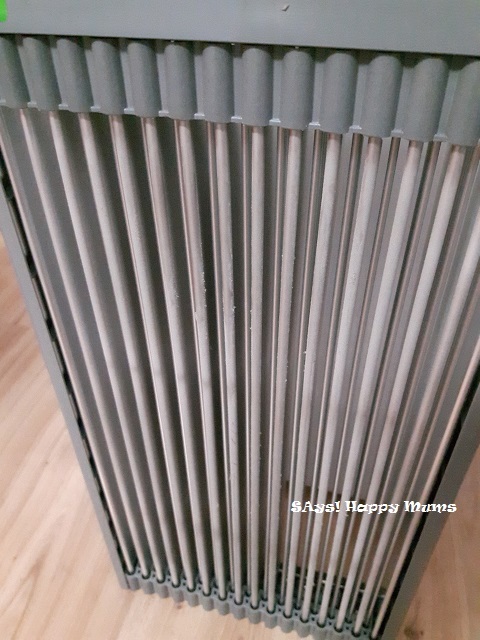 Following our happy experience and a little study on air purifiers, my hubby and I have chipped in our two cents’ worth to help close friends and families scrutinize their potential purchases over the years. Conventional air filtering technology makes use of filters to remove particles from the air. 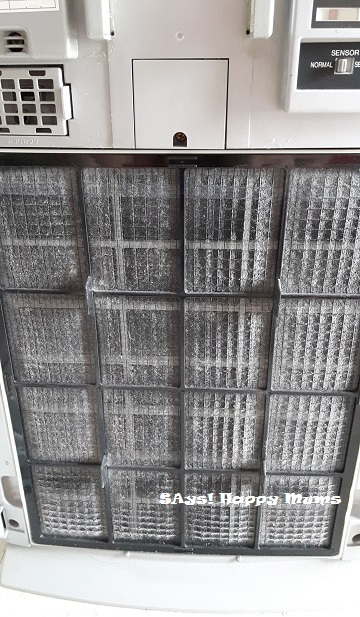 While TRUE HEPA filter has passed efficiency tests to remove 99.97% of particles (from the air that passes through it) that have a size of 0.3 micron in diameter, it is not all the time consistent as some microbials are actually smaller than the 0.3 micron a HEPA air filter is capable of removing. Data extracted from The Engineering Toolbox. TRUE HEPA filter has always been the standards to look out for in air filtering capacity. However if it is lagging behind in terms of efficiency when compared to that using the electrodes, don’t even consider brands/models claiming to have “HEPA-like”, “HEPA-type”, “HEPA-style” or “99% HEPA” filters which have been attempting to convince buyers with ~97% to 99% filtering efficiency. Note again that the figure to look at for any filter efficiency should be 99.97% for particle sizes of 0.3 microns and above. 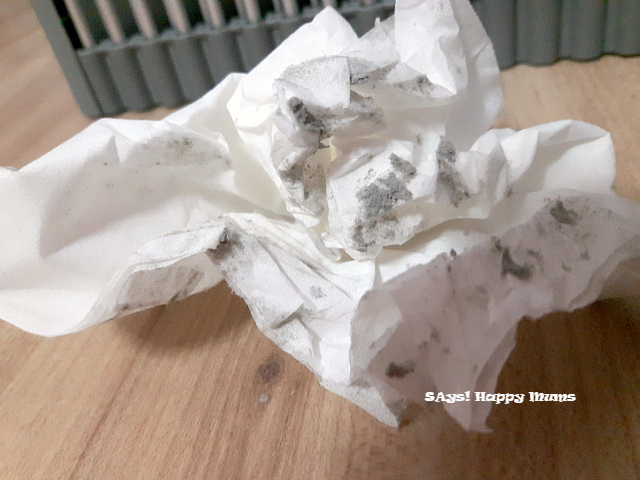 These HEPA-wannabes are in fact unable to conform to the standards set by NIOSH for respiratory filters. For the unknowing who doesn’t do proper research before purchase, there is a chance of going home with a falsified sense of peace of mind. 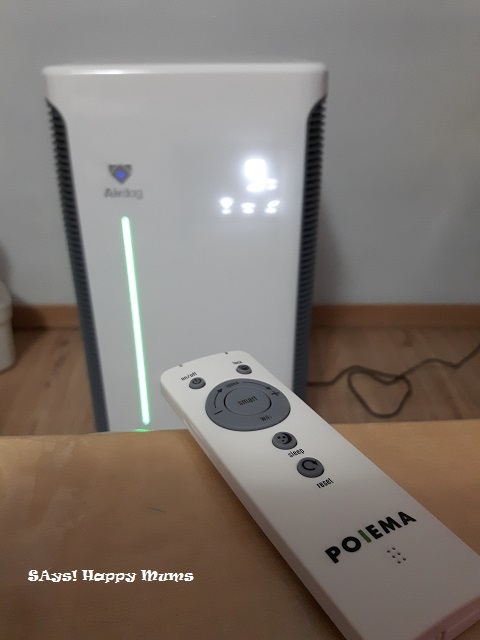 On the Poiema Premium P500 Air Purifier, it filters air by generating an unique electrical field which traps pollutants and common allergens (from the air that passes through it) and that it has the capability to remove particles as small as 0.02 micron in diameter (100x smaller than PM2.5). 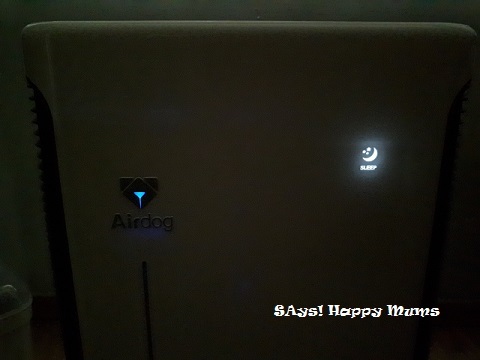 Our Sharp air purifier costed us $580 when we first bought it. It is equipped with a TRUE HEPA filter that in recent years costed us another $180 per piece to replace. Not only about the high replacement cost (for a piece of filter?! ), we also could not find any OEM replacement filter that is made to the size for this brand and model. Not even from Sharp’s current line of models. It ultimately took us more than 2 months to get directly from Sharp (because they do not keep stock). C’mon! The machine is only about 9 years old and still running without breakdown but there’s no more filter for replacement?! Each filter is expected to last for about 5 years (assuming usage of 12hrs/day). We changed it on Year 4 when the filter replacement indicator lighted up. We ended up ordering 2 pieces for fear of premature obsoletion. Gone are the days when we will turn on the aircon or use electrical appliances at home without thinking second about saving energy (and money). When we were young, we want comfort, convenience and speed. Household electricity bills were our parents’ worry and we mostly did not understand the larger impact of energy usage on our environment then. Nowadays, we buy energy-saving refrigerator & washing machines and make do without the electric airpot. The air purifier looks like a small electrical item but the running cost of keeping it powered 24hrs a day (like hell, now) can amount to a substantial sum. To determine annual electricity cost, look for the manufacturer-listed wattage of the air purifier you are considering and use the following equation to determine the annual cost in electricity needed to run the air purifier. *WEF 1st Oct 2015, the electrical tariffs for the current quarter is 20.35 cents per kWh. For purposes of calculation, I used flat rate for entire periods of 4 years and 8 years. *If running for night time only, simply estimate by halving the costs. *I can’t find the cost of Blueair 503 in Singapore but found it at USD659 (USD80 for filter) on Amazon and used 1.4 as est. current exchange rate. Unit price excludes shipping costs, if any. *All calculations used are base on above tariff formula and also with the use of max. energy consumption (Watts) for equal comparison. *”Sharp FU60SE” is my existing set before I have Poiema P500. The 4-yr cost is no longer valid. The set is now 9yo. From above table, conclusion is made on the estimated final costs for 4-year and 8-year usage, taking into consideration running costs and replacement costs as well. Poiema P500 although appears to have seemingly high initial costs, it actually works out to be the cheapest in the long run for a unit that covers 60m2 (half the size of a typical new 5-room flat). I extracted the figures from Table 2 above and re-tabled them to present the cost per square metre. As it is seen, Poiema P500 also end up with the lowest cost per square metre of air purification (base on 8-yr usage). Many air purifiers make use of a motor + reverse fan blade to draw air through the air filter because the only air that is treated is that which passes through the air filter. Some models have a larger fan and louder noise in order to do the same work. Unfortunately, they become white noise after some time. My old Sharp air purifier is so loud at highest speed that we are made to maintain it at low speed during sleep time all these years. Looking back at Table 2 again, Poiema P500 has one of the lowest noise levels whether it is in lowest or highest speed. There may be other models with similar performance, for example the Airfree WM600 or even more out there. My tabulation is base on a few selections of air purifiers serving the same range of floor area in terms of metre squre. As a stand alone observation, my family has been sleeping without the low humming noise throughout the night after we got the Poiema P500. In fact, the “noise” from the Poiema P500 is so low that when everything is absolutely still (the few minutes before falling asleep), we can hear a very faint ‘tick-tick’ sound if we listened really, really hard. The ‘tick-tick’ sound is actually the sound of the air particles getting stuck onto the collecting electrodes. It did not occur very frequently as logically so, the real-time PM2.5 reading was only in the region of under 10-30. The collecting electrodes act as magnet and are positive to pull all the charged particles to them. For years and years to come, we will be getting used to soundless nights again. Base on specifications, it is 20dB at full speed. It is even quieter than my Mitsubishi StarMex airconditioners <3! The reason why the Poiema P500 has such low noise level is because it does not depend on motor fans to circulate air. Instead, it makes use of the generated magnetic field to “push” air around. After 2.5 days of continuous usage, I could not contain my curiosity anymore and went to “play” with the unit. What I found was fine powdery dusts stuck onto the Collecting Electrodes which at first look, still very clean. 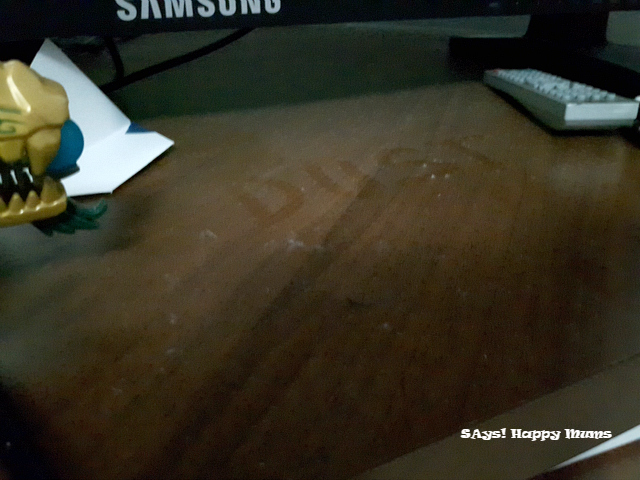 I wasn’t expecting my indoor air to be so dusty since my entire house was kept sealed whenever the PSI level is up. Take a look at the video below and be shocked. There is a long bar light indicator (below dog icon) which uses coloured light to reflect the combined levels of TVOC and PM2.5. Colours like green, yellow-green, yellow and red indicates air quality level of excellent, good, light pollution and serious pollution respectively. 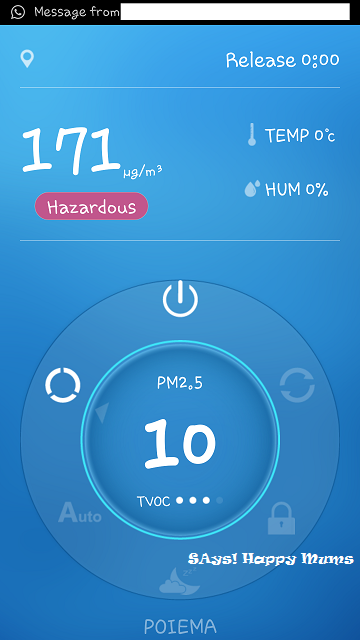 Below the PM2.5 indicator, H (MAN) stands for manual override. The indicator will appear once the speed is changed using the remote control or Smart Phone. WIFI indicator works with Smart Phone as a remote control. Speed setting is available in low, medium and high. I have observed that when manual override is not set, the unit is always at low setting by default. Initially, I have worry about excessive generation of magnetic field within the house as the Poiema P500 works by generating magnetic field between the Collecting and Emitting Electrodes. Doesn’t it seem questionable that a standalone unit with almost non-detectable airflow is able to clean up to 60m2 of floor area?? Will there be a huge magnetic field frying my family’s brain in the house?? Thankfully I found an app on my Android – Ultimate EMF Detector and happily went around the house watching the meter for unusual activity. The Poiema P500 on the other hand, will signal an alert on the display panel to wash the Collecting Electrodes (Emitting Electrodes do not require washing at all) after every 200hrs of usage. Despite so, I can choose to ignore or reset it anytime. In air purifiers with built-in ioniser, the ioniser pushes out charged ions into the air to attract air particles, make them clump together, form a larger diameter and eventually gets heavy enough to drop onto the floor or whichever grounded surfaces like wall or furnitures. From all these years of usage, I have hated the powdery layer of dust that appears almost after a day of vacuuming and mopping the floor and wiping all table top surfaces. I can feel it while walking around and I know it’s on my bed as well. 2 days worth of dusts on my table. With technology, it is now possible to remotely control the air quality at home from wherever I am. My Dashboard by POIEMA (on Android) serves as a remote control that connects via WIFI. It’s pretty fun to play with my WIFI remote or to check on the air quality from the next room. I read that some people used the function to monitor their domestic helper at home. 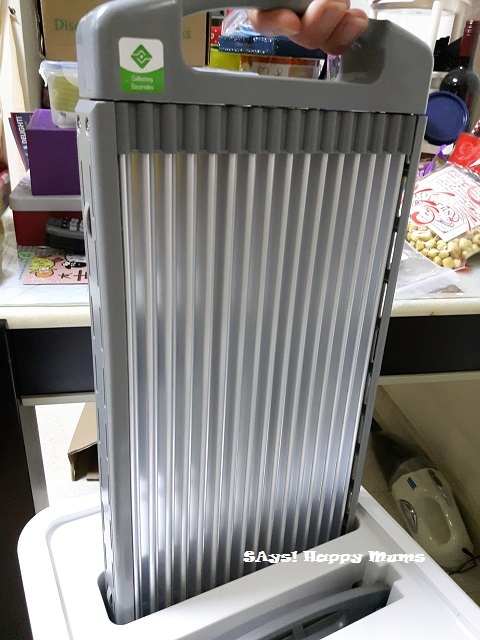 If they see that the air quality index of PM2.5 having very good reading of 0 – 35, they would know that their helper has secretly turned on the air-conditioner. ^.^ However, I had problem using the app on my Samsung A8. It crashes my phone and restart each and everytime if I am not within the reach of my house WIFI. Poiema P500 measures 315 (L) x 315 (W ) x 590 (H) mm. Occupying a floor space of about 1.5 pieces of A4 paper, the unit is space saving with the added on benefit that the air intake and discharge are located on the left and right sides of the unit. There is no need to keep a minimum distance of typically 60cm from the wall too. I realize that the unit does not emit significant amount of heat even after prolonged operation. As recommended by Poiema Singapore, it can be operated continuously for 24hrs a day to monitor and control the indoor air quality. With an electricity bill of only $5 per month, why not?! Poiema P500 comes with 1-year on-site warranty against manufacturer’s defects. 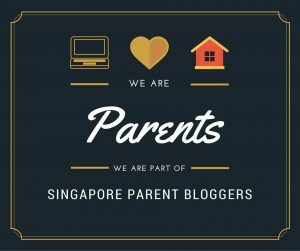 For more information, pls see Poiema Singapore. Poiema P500 retails at $1399 at Poiema’s eStore or $1299 at Mega Discount Store (Authorized Reseller), both with free delivery within Singapore. Alternatively, buy at Rakuten (also Mega Discount Store) for points. At the end of the day, whether you would choose a higher upfront payment or a lower initial cost, it’s your call to assess and decision to make. Whatever it is, having an air purifier to control indoor air quality has become more of a need than a good to have nowadays. As usual, always remember to fully ventilate your house whenever the occasion allows! Half an hour also good! We have been sponsored a set of Poiema P500 for purposes of this review. Thank you for joining us on SAys! Happy Mums. If you liked what you read on our blog, please follow us on Facebook for the latest updates. We hope to see you back again soon. Good news!! Poiema is giving a discount code and voucher. P/S : We are not getting any commission.